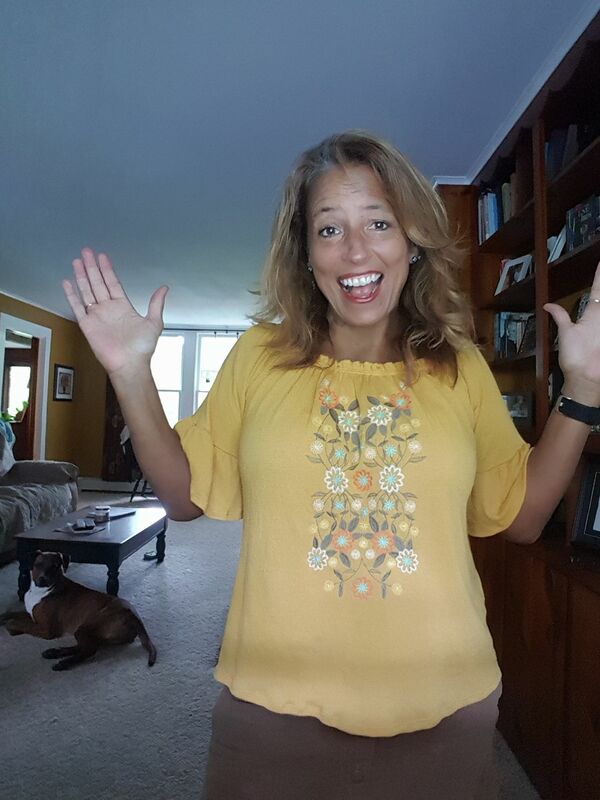 Blogger's Challenge #71-- Cami Saves the Day! Christams cards we can afford to mail. More Sketch Challenge #41 players. A challenge for you to try! Hot Cards! and more sketch players too. Storage Units Ink & More Sneak Peek! Yummy Cheesy Biscuits! Paper Crafts Project. More Sketch 40 players already. Last one for sketch #39! Blogger's Challenge 69 MoJo Stye! Don't be a turkey! and another sketch player too. Blogger's Challenge #68 and WT187 Combo. CC187 and another sketch player too. More Sketch Challenge 38 players! Finger Football? How cute is this little game. Yikes, I missed my buddie Barb! More Sketch Challenge 38 players already! Monday Lunchtime Sketch #38 Players. Cheering for you - And another Sketch Player too. Blogger's Challenge #67 Falling For You! And even more Sketch 37 players. Last Day of the Sneak Peeks at SUInk and another sketch player too! If you have not had a minute to check these out yet you better get a cup of coffee and a pen and paper ready to make your wish list. The design team really ROCKED the samples with this darling sets. They will all be available tomorrow (shhh, I also heard there will be some specials for the month of November so be sure to check back for those). Here is the list of who was showcasing what again for you. I am so in awe of these beautiful samples. 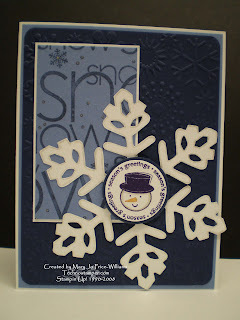 Jen Del Muro...SNOW DAY - Guest Designer! 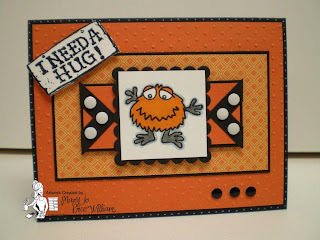 And while you are looking at great samples don't miss this yummy card for my sketch challenge..
Every now and then some wonderfully creative individual posts a project that is just so awesome that you have to CASE it. Well, usually we CASE and change a few things to make them our own, but not this time! Cami's project was just brilliant and absolutely perfect--I loved everything about it. I told her I loved her a few times on the day she posted it, lo. I used this project in two of my clubs, made up all of these for my son's class and it is now my Blogger's Challenge. Cami, you ROCK baby! I did leave off a few details from hers to make them just a tad easier, after all these are for 7 and8 year olds who will eat the candy and toss them, lol. I try not to think of that when I am making them! 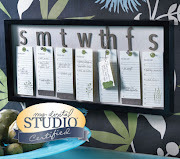 So go a head and head over to Cami's wonderful blog HERE I am sure you will find something you want to CASE too, I love her style. Here are the projects, we filled them with gummy body parts! GROSS! Hope everyone has a Happy Halloween, be safe-- and don't eat any wraped chocolate coins the were recalled (in case you did not know)! Other: Chalk, circle punch, tab punch, sicissors, black gel pen, white gel pen, ribbon, scor pal and TONS AND TONS of adhesive along with LOTS of GROSS body parts! Remember this is my theme this year. The price of EVERYTHING has gone up so I can not afford to spend extra on postage for the 70 or so cards I mail each year, so the focus is on cards that will mail for the regular rate. Of course I will make a few mega layer, mega chuck cards to hand out! 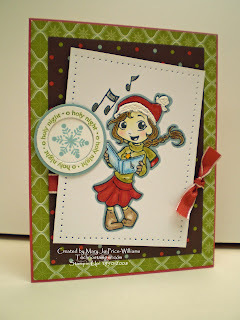 This first card is made with my new favorite Christmas stamp set from this years catalog. The funny thing is it did not stand out to me when just browsing the catalog, I had to see samples with it to envision how beautiful it is. Here is the rest of the set, is it not just gorgeous! 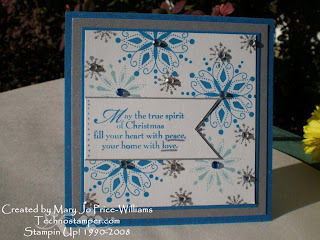 And this second card is with my favorite Christmas stamp from before this catalog, it is still available too! Another beauty, don't you agree. And this is where I got the sentiment. Other: Nestabilities, large oval punch, cuttlebug, glitter, glue pen, faux brads, white gel pen. Thanks for stopping by today, I hope to create a bit more today to catch up on challenges but not sure how much time I have, lost of PTO and church commitments to catch up on. The original sketch can be found HERE. Melissa at What do you (th) Ink? Super Samples Ladies, makes me want to go stamp NOW. Hmmmm, can I find time now? Maybe--I'll be back soon. can only add one other neutral color. I can not wait to see all of these creations. There are so many cool shade of orange. Should be fun, so Whatchdoing? Why not play along? If you do please leave us a comment with a link so that we can see what you came up with. And as usual it does not have to be SUInk stamps but we do love it when it IS! Here is my sample. 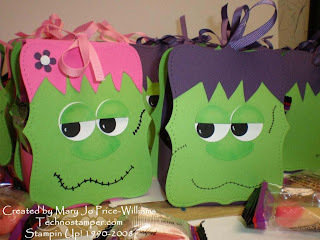 I used this adorable little "monster" from the Monster Party set. I just adore him he looks just like the little guys I used to doodle on my folders when I was younger (much younger, lol). I thought he looked like he was coming to give me a big hug so I dug out this old sentiment from a retired SU set. Lovin this. So bright even with the black. I used my Monday Luchtime Sketch Challenge #33 for the layout. Other: Markers, watercolor pencils, nestabilities, cuttlebug, faux brads, photo corner punch. Don't forget about the sneak peeks going on right now too! 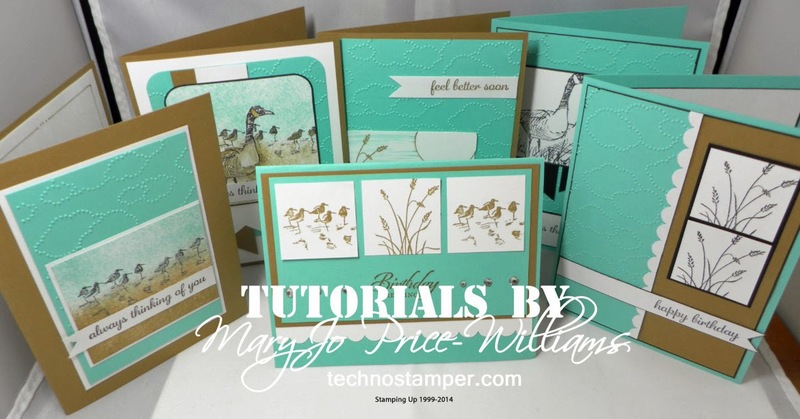 Yesterday's technique lover's challenge #192 was napkin transfer, also know as Hot Card Technique. I learned this from the Technique Junkie Newsletter a few years ago. I really love this technique but don't do it often because I don't want to risk being caught with an iron in my hand, people might think I know how to use one and then my work load will increase which of course means a cut in stamping time so SHHHHHH. 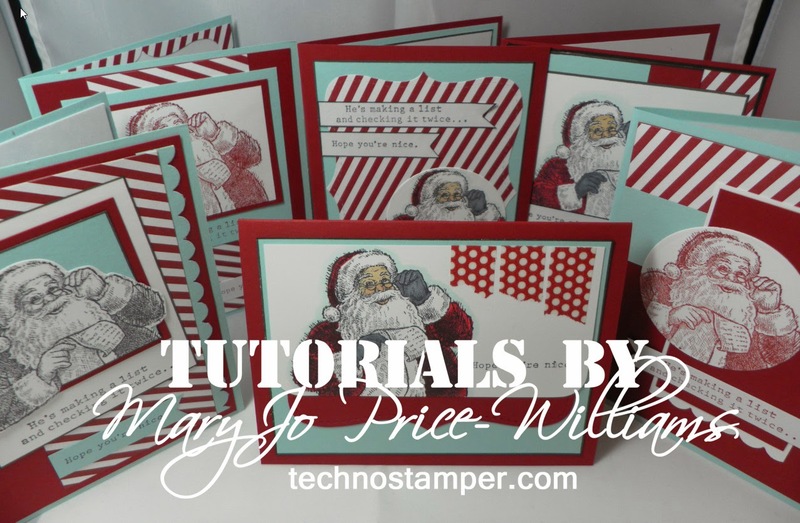 Basically the technique requires you to find some fancy decorative napkins and iron them to freezer paper then use them on your card. Here are the directions. Ironically as I was rearranging my stamp space on Sunday I found a box with leftovers from these two cards, I used them for a technique class and a shoe box swap quite a while ago so I figured now is as good a time as any to use up these leftovers. I got out the (you know what) and got to work. Here are the samples.. Accessories: napkins, iron, freezer paper. 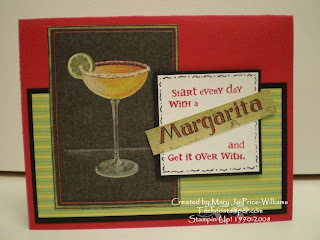 Such a fun technique, and it really feels like I got a TON done today -- I made 5 cards two of the margarita and three of the rose. No one needs to know they were alread designed and prepped, lol. Still lots of time for you to play along too! 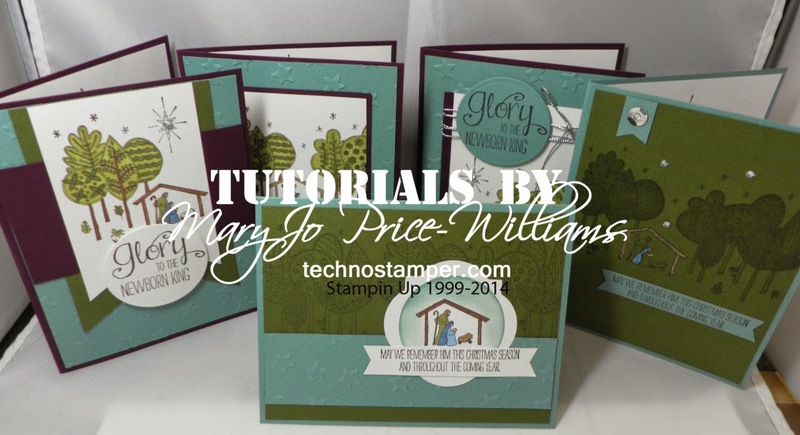 What are you waiting for, clik on the link at the top of this post to see the original post and get stampin. Don't forget to leave a comment with a link so I can share it on here! Have a great day! Sneak Peeks begin now-don't miss the excitement. Today is day one of the sneak peeks for the new sets that Storage Units Ink and More will be releasing on November 1st. 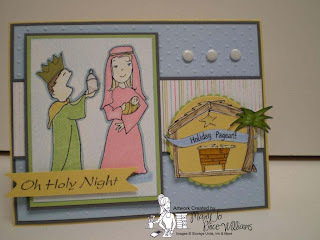 I get to show you a set called Oh Holy Night. It is the cutest little set! The set has kids preforming a Christmas pageant. I don't know about you but watching little ones preform especially around Christmas time is my favorite holiday tradition. Paper: So Saffron, Bashful Blue, Certainly Celery, Basic Grey and Whisper White with a small scrap of retired dp. Other: markers, cuttlebug, nestabilities, faux brads. This set and six more will be available on November 1st and believe me you are going to want the ALL! The excitement starts today with the first of the sneak peeks and continues until November 1st. Here is a list of who will be showcasing the other sneak peeks each day! I can't wait to see them all myself! WOW, there are some awesome card here! Thanks so much ladies, you rocked this one. Do you guys love to eat as much as I do? I so enjoy food, especially appetizer type food. 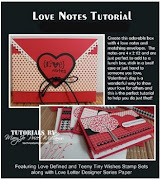 And of course you all know that I love to paper craft, duh! That is why one of my favorite magazines is the Paper Crafts Gourmet. What a wonderful idea this book was. 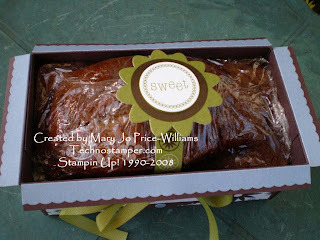 There are lots of fun recipes and creative ways to package or serve. It is a MUST have in my mind. Here is a link to where you can order it. 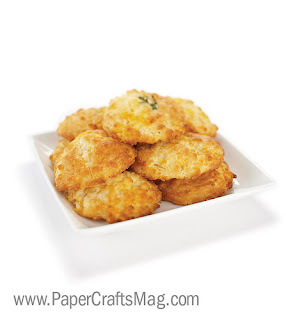 Paper Crafts Gourmet . I also have a project from there to share with you! How cool is that, a sneak peek! Do you ever eat at Red Lobster? My son loves it there and his favorite thing is the biscuits. You know those cheesy garlic biscuits. Well this magazine has a recipe for a biscuit like that! Yummy! I can not wait to try this one out. It will have to be on the sly since my hubby loves them too but he is diabetic and probably should not eat them. I will be making this the next half day of shool for me and my son! 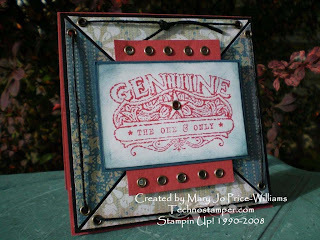 This was for today's featured stamper challenge on SCS. 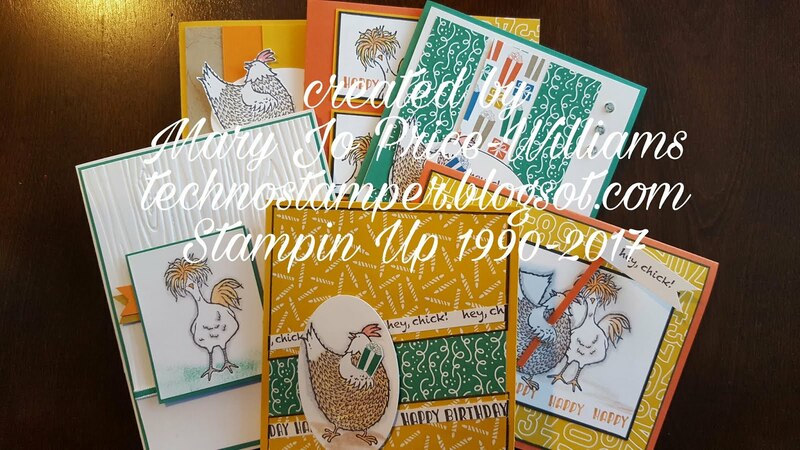 This weeks stamper was Kay K aka SpeedyStamper. What fun gallery to check out. That is what I really love about the feature stamper challenge, it gets me in gallery I may not have seen before. 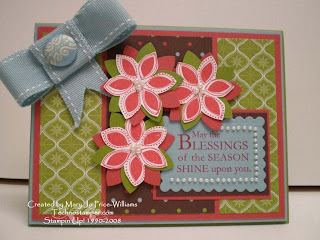 I really love the colors in the Holiday Treasures paper. And I was determined to make this big ribbon work with the card that took me forever! I am not really sure how well it "works" but it is on there in a semi pleasing way, lol. Here is the card I chose to case Delight in Life. Welll I did it and the electric is still on--don't matter now I am going to bed. Goodnigt! and the sketch. I am excited to see what everyone does with this one. I have so many ideas, hopefully I will get a few more done before the week is out. I would love it if you played along. If you do please post a comment here with a link so I can sha1re it with everyone else. And if you post on SCS (which I always forget to do) please use the key word TSSC41. Be sure to stop back around noon EST to see what the team did with the sketch. I will be right back with my featured stamper challenge card-storm willing. At least I got this one up! You still have time to play too! Why not give it a go--HERE it the original post with the sketch. Great Halloween cards--can't believe it is SO close! OK, so I am way late with this week's Blogger's Challenge. But as they say -- better late than never. This week's challenge was to create a gift for someone. Well I bought these items at the dollar store more than a month ago with the intentions of altering them. So this was the time to do it. I am pretty happy with the results. It was fast and easy too--not too many details but still nice and where else are you getting a gift for THREE DOLLARS! The pencil holder has all four images from the Pocket Silhouettes set with the words, love, laugh, dream and imagine. I kept to three colors-Kiwi Kiss, Pink Pirouette and Riding Hood red with a accent of black. The hardest part of the whole thing was the calender. I finally found one that would fit on SUDSOL. I am sorry I can not share it here, it is demonstrator only site that you pay to join and we are not allowed to share files from there with others. If you are a demonstrator there is a blinkie at the top of my blog that will get you a free trial period that you would be able to use to download it. I will look around for another calenar that I CAN share. The bottom two spots below the calendar are for pictues. I was going to decorate it but decided that eveyone loves pictues on their calendars so I chose to leave that part as is. Hope you enjoy. If you have any quesions please let me know. You need to leave your e-mail in the comment though since Blogger don't like to give it to me, lol. Be right back with more Sketch 40 players--I am late with that too! OK, so this is not my normal Friday Blogger's Challenge post. The kids had half a day and I of course forgot that so it has thrown off my whole schedule, lol. That that it is a bad think, I love spending time with my son. Just means you all will have to be patient till I get to the challenge and get it posted. But I do have more sketch players to share with you! Thanks ladies. Be back soon. Here it is, the easy as peasy bread box. I had a bunch of requests for this so here it is. You can see the original box HERE. As long as I needed to make another one I thought I would combine it with the WT189 challenge on SCS. The challenge was to use one word on the front of your creation. So I chose Welcome. 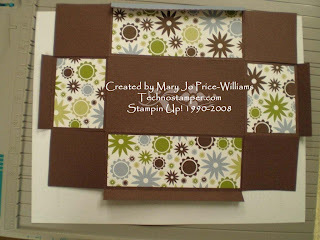 I always loved these retired papers and thought it would be a great time to use up some. Here is the finished box. 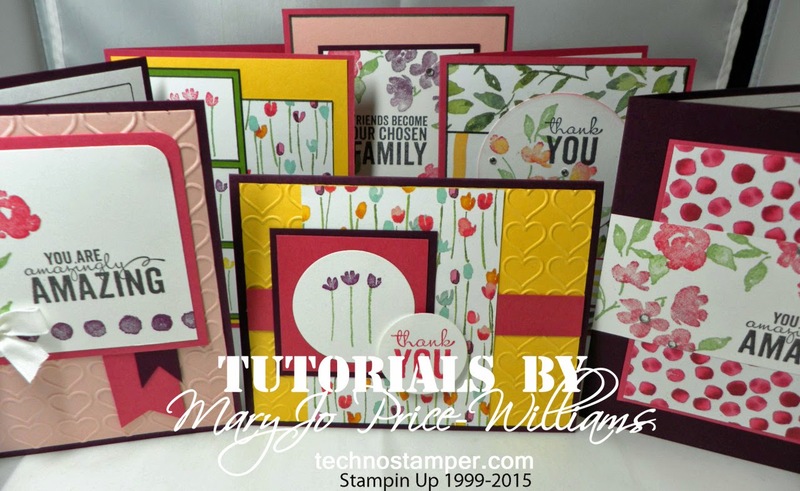 You will need to start with a piece of 8 1/2 by 11 card stock. 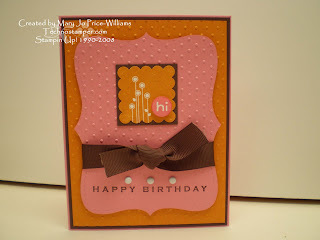 I chose Chocolate Chip textured card stock for this one. 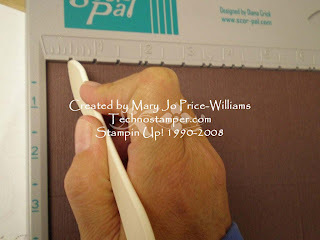 If you are using the scor-pal you will need to line up each side at the 3/4 inch mark and then score at 3 1/2. Do this on all four sides. See picture below. If you are using a different method to score you need to score all four sides at 2 and 3/4 inches. Next you will move the card stock over to the edge and score all four sides at 1/2 inch. 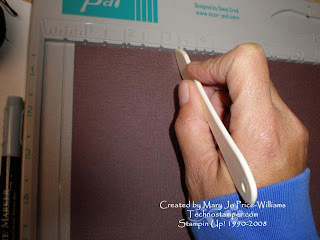 This is the measurement with or without the scor-pal. Now you will need to grab your scissors or cutting blade and the two short sides on the 2 and 3/4 score lines up to the 2 and 3/4 score line in the other direction. Then you will cut of the little tab on all four corners. See picture so you know what I mean. Next you will use your bone folder and fold over all score line so that they are nice and crisp. If you want to use a edge punch or decorative scissors this would be the time. I chose not to do it on this one but did on the original. You would be decorating the four 1/2 inch scored pieces that you did not cut off. 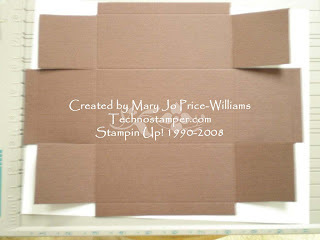 I then added designer paper to the four sides of the box. Notice that I added stickers to the 1/2 inch scored pieces on this one so they need to be on the opposite side as the designer paper. See photo. Now all that is left to do is to fold, attach (I used sticky strip) and decorate. Here is a view from the top showing the stickers I used to decorate the bread itself. with a link so I can come see! All supplies are from the retired Home Again Simply Scrappin kit except the old olive ribbon, the chocolate chip frame is a sizzix die and the sentiment on the front which was computer generated. Thanks for stopping by, I will be back in a minute with more sketch players too! Yippee! Here are even more wonderful samples with this weeks sketch already! HERE is the original post so you can play too! There you have it, three more wonderful samples for this sketch! Thanks ladies. SUINKWWC11 -- Treats for our Sweets! 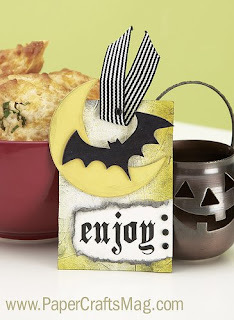 Do you still need a last minute treat holder for Halloween? Already done with that, how about a special treat for a loved one. 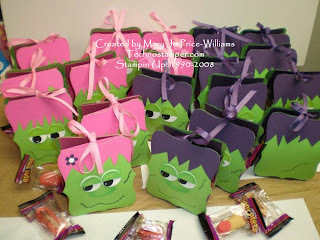 Could be cookies, candy, cupcake any type of sweet treat and a creative way to present it. So here is my sweet treat. 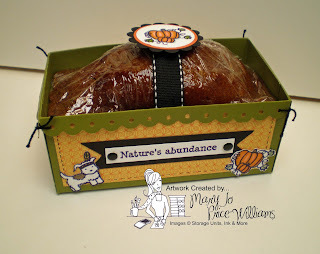 Some fresh made Pumpkin bread for a friend. I made the little box from Core'dinations card stock. It was oh so easy. The rest is pretty self explanatory. If you want to know how to make the box let me know. If enough people want to know I will do a tutorial but it really is just a basic box. 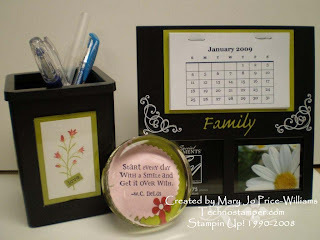 Other: ribbon, circle punches and scallop circle punch, faux black brads, markers, scallop border punch and small hand held circle punch, twine. These are all fabulous, thanks ladies! Today's color challenge on SCS. Here are a few details, got to make it short have lots of errands to run. Thanks for stopping by! Here are a few that were posted just a tad bit after the original players post but I had a class last night and did not have time to post until now. Sorry ladies. I am loving the large images we can use with this sketch. Great card ladies. So here they are! Today's sketch players. There are some really great cards here so be sure to check them out. and here is one more from Erica who got up really early to get this done today! Now where is yours? I can't wait to see it. Don't forget to post a link here so that I can share it with everyone else. Hope you have a great day! I am so glad it worked out the way it did though because as I looked for the print out of the sketch I came across these images that my friend Stephanie sent me for a mystery image challenge! The bad news is I think this was supposed to be mailed more than a week ago! YIKES, I will have to add a little something in the package for my partner since I am so late. I really hate being late too. So on to this week's sketch. It seem to be the rage to angle you focal image so that is what we are going to try out this week. I think it was actually a really great sketch for the images I had to work with. Got lucky there! Here is the sketch and my card. I still feel like my card needs something where the ribbon is tied but I wasn't thinking clear enough to figure out what, lol. I do like the card though, this little girl is adorable. 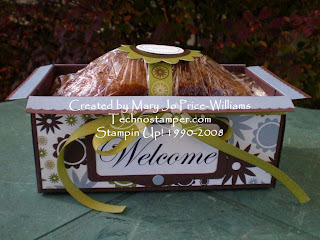 I matched her up with the Holiday Treasures Designer paper from Stampin Up!. The base of the card is Ruby Red. She was colored in with pencils and markers. Sure hope my partner likes it --- now I have to find out who that even is and get this in the mail! I would love to have you play along this week. It is so fun. And there really are no rules. If you make a card don't forget to leave me a comment on this post that includes a link so that I can share it with everyone else. 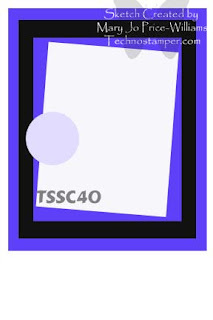 Also if you post in an online group such as SCS please use the keywords TSSC40. Can't wait to see what you come up with for this sketch. Hope you have a great Monday and an terrific week! I will be back around noon EST to post the Monday Lunchtime Sketch Player's cards so be sure to check back--they are always amazing! Till then -- Goodnight! Here is the last sample with sketch #39. We had some wonderful samples this week. Thanks to everyone who played. I will be right back with this weeks sketch after this. Such a beautiful fall card. Thanks Margaret! So Glad We Are Friends and Glad to have more sketch players too! I keep finding cards that I forgot to post! This is one from my last All Occasions Class. I am really loving these hostess set Best Yet. Such fun fonts and sayings. 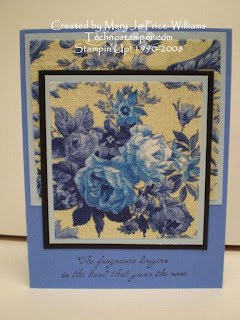 This card is also using the Pocket Silhouette stamps set that was on sale last month. I love the colors don't you? I find that one of the best way to find color combos is to look at what SU has already done for us. Just find out what colors are in the different designer papers. You don't have to have the papers to use the colors. 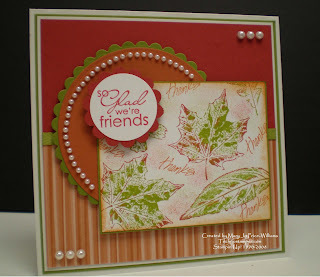 They have such great combos.These colors are from the Haiku paper pack. Paper: Tangerine Tango, More Mustard and So Saffron card stock and a piece of the Haiku paper. you still have all day to join in. Pat at The Technique Trail. Limited Suppy Challenge and more sketch 39 players! - Use the color blue in your card! (Doesn't have to be the main color, but be sure to incorporate it in there! So what can't you use today? No punches, no cuttlebugs and no embelishments other than the ones mentioned above! As you can tell from the above -- which I just NOW noticed I cheated. I used both sides of the dp. Guess I forgot that detail when I went to create. I can think of a bunch of other things I would have rather done if I was going to cheat, lol. Oh well, I do like the card so it is not a total waste, lol. Here are some more sketch challenge players and NONE of them cheated, lol! HERE is the original post in case you want to play along. You still have plenty of time! 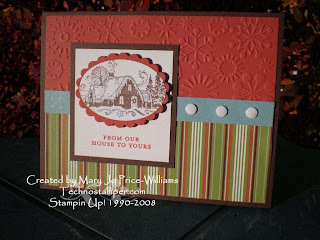 Week 69 of the Blogger's Challenges was to use the colors, Old Olive, Riding Hood Red and Really Rust along with a white or confetti if we wanted. And I did want--mostly because I was making this a 6 x6 square card and that was the only one of the colors that I had in 12 x 12 so I really had no other option if I was going to stay true to the color challenge. 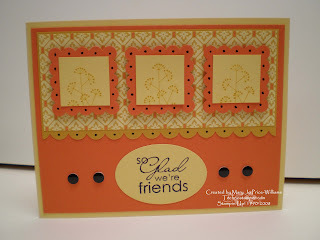 At first I did not think I was going to like these colors but after playing around a bit this morning I realized they are perfect for a nice fall card. So as I was thinking about layout I seen the MoJo Monday sketch printed out on my desk and thought - yep, that is it. I just had to change the sketch to a square card and the rest just fell together easy! I actually like it. What do you think of the colors? HERE is Julee's post and her original sketch. She always has such fun sketches! The leaves are inked in Old Olive and then I used the Rock and Roll technique on the edges with Riding Hood Red and before stamping I added the Thumping Technique with Really Rust! 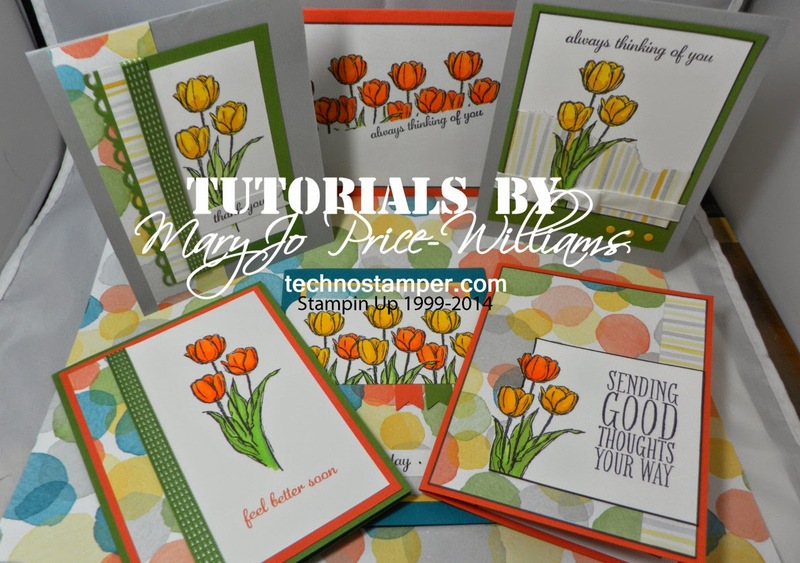 Both techniques can be found in Pat's Technique Junkies Newsletters. Paper: Confetti White, Old Olive, Really Rust, Riding Hood Red, Whisper White card stock and a piece of Really Rust dp from the Fall Flowers collection. 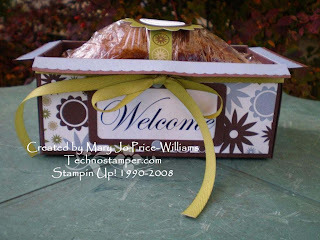 Other: sponges, markers, nestabilities, scallop circle punch 1 12/ inche circle punch, pearls and Old Olive twill ribbon. I will be back soon with some more player's for my Monday Luchtime Sketch Challenge #39! if they would really use it much. The first few things we made with it were treat boxes or holders (which I still need to share on here). So for this month's All Occasions class I thought it would be fun to use it in a couple of the cards. These are the results. This first card is using some of the stock pile of Purely Pomegranate card stock that I have. I matched it up with the new Pink Pirouette card stock. Very pretty together. Ink: Purely Pomegranate and Basic Black. Other: 1 inch and 1 1/4 inch circle punches. 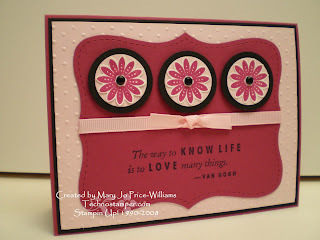 Bo Ho Blossoms punch, black brads, pink ribbon, top note die and swiss dot embossing folder. This next card is my favorite. Wonderfully fun colors. I really like the die used in this direction with a square on top. Stamps: Say it with Scallops and It's your birthday. Thanks for stopping by today, I hope you have a fabulous day! Here are a few more Monday Lunchtime Sketch Challenge #39 players too! 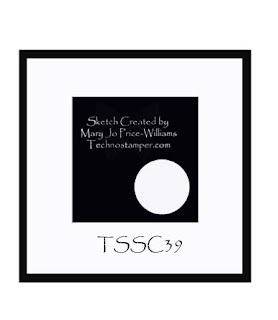 I have two more sketch challenge samples to share with you today! HERE is the original post in case you are feeling like playing along. Great samples ladies, thanks so much for joining in on this weeks challenge! So Whatcadoing? It's Wednesday and even though I should be doing lots of other things the weekly challenge is my favorite thing to do! I hope you will set aside all those things you "should' be doing to join us in this week's challenge. We have an inspiration challenge for you this week. Here is the picture. Isn't this bedding so rich and elegant feeling? Two of my favorite colors are red and black so I really love this bedding set. You can allow the inspiration piece to inspire you in any way that you chose. There is no right or wrong with inspiration challenges. You can be inspired by the color, layout, feel or anything else you chose. Afterall, we are all inspired in different ways. I hope you will allow the bedding set to inspire you and play along! Rember you do not have to use SUINK stamps, but why not?! If you do play along please post a comment here so we can all come check it out. Also if you post on SCS please use the key words SUINKWWC10 - no spaces. Here is my sample..... I had a real hard time not adding more to this. But I really wanted to keep the clean lines and bold red from the bedding. The images are from Giving Thanks set. 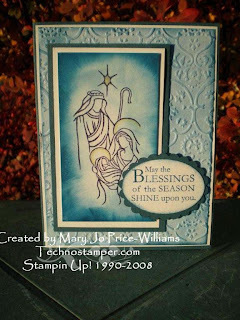 I stamped the image in Versa Mark on the background and then embossed in white. There are a few lines scored on the other side with my Scor Pal. The brads are lined up with the scor lines. The focal image is really simple and it was really hard to not embellish it more but I think it kind of feels like one of the pillows on the bed. So there you have it, the inspiration piece and my sample. Please check out the other posts on the SUINK blog to see the samples from the rest of the design team, they are awesome! Hope you have a wonderful Wednesday! Show off your spirit! And more sketch players too! This was actually one of the first things I made with this set. Isn't it so cute. 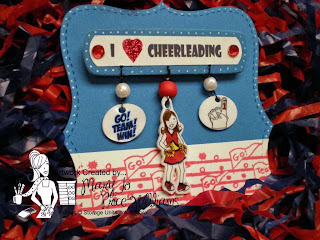 It is a pin with little shrinky dink images stamped from the First and Goal set from Storage Unit Ink and More ! So easy and fun too. Wouldn't this be adorable for a little girl? I love it. Here are some more sketch players for this week's sketch challenge. You can find the original post HERE... I would love to have YOU play along too. Great samples ladies, thanks for playing along. Wonderful samples ladies. I am so inspired and I am sure all of my readers are too. So we will for sure be seeing lots more samples this week! And here is the card. Simple but I think it works. What do you think, too simple? other: Scallop punch, 1 inch punch, ribbon and mini bling stones. Can't wait to see yours! And don't forget to check back tomorrow to see what the other girls do with the sketch. It is NEVER disappointing! I will be a bit late posting since the kids are off school and I will be going to get pumpkins with my cub scout den during the day. So keep checking back. Hope you have a great Columbus Day! Super job Lori. Don't go too far I am posting the new sketch challenge right now! I was looking through the Studio G stamps I bought about two months or so ago and have not used and came across this stamp that says "Don't be a Turkey!" And I immediately thought of my SUInk stamp sets and this card popped in my head. The girl is from the First and Goal set and the turkey is from the Bountiful Harvest set. I love how the turkey is not paying attention to the girl at all -- looking the other way! I have such a strange sense of humor. I thought about putting "or we'll eat you for Thanksgiving dinner" on the inside but thought maybe that was pushing it a bit too far, lol! Have any other ideas?? I love those little mice. Thanks for playing along Sue. Rock On Limited Supply Challenge and another sketch player too! So do you think you can use too much bling on a card?? I have mixed emotions. Today's Limited Supply Challenge on SCS was called Rock, Paper, Scissors. Here are the details. Today we are sticking with the basics: paper and ink, with an added element. “Rock, Paper, Scissors” is our Limited Supplies Challenge for this week. 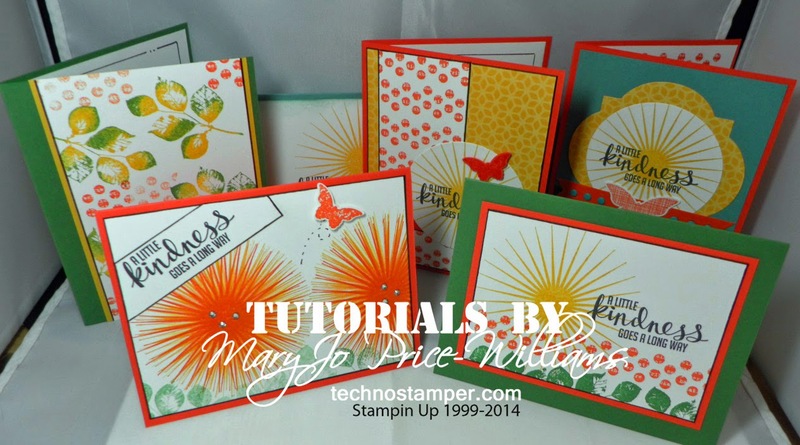 You may use any stamps with any theme, and any coloring tools. * ROCK: Only embellishments that are gems, such as pearls and rhinestones – anything with sparkle or bling! Rock can ALSO mean anything metal, as in hardware! * SCISSORS: Only decorative scissors and straight cut paper cutters. No Nestabilities, Cuttlebug, Big Shot, punches, etc. Here is my sample. I love the brushed silver with the Pacific Point card stock. Beautiful together. And now another card share with this week's sketch challenge! Thanks so much for playing along Sara.